I'm really looking forward for this movie as it is the last movie from The Hobbit trilogy. If you don't know, I'm a huge fan of Martin Freeman and can't wait to see his acting again. So, without too many chit chat, let me tell you my opinion! 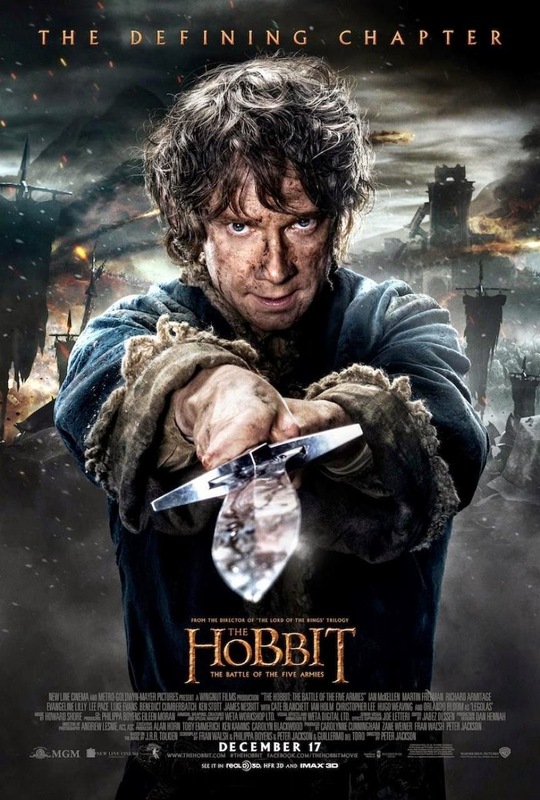 Martin Freeman as Bilbo and Richard Armitage as Thorin are the most precious things from this movie.They gave the most stirring performance in this film that worth your ticket money. All my favorite scenes from this movie are always about their beautiful friendship and interaction. As expected, the battle scenes looks extravagant with lots of violence. Ryan Gage as Alfrid creates many laughters. All cast give good performance for their respective roles but they were given more stunt than lines so let's just say that they're underused. As you can see from my Desolation of Smaug review, I hate the added love story between Thauriel and Kili. It's so fake, unconvincing and empty, I cringe everytime I saw their scenes on the screen. The Hobbit: The Battle of Five Armies is not magical, but it's still an entertaining movie. Some of the scenes might pissed off fan of the original book (for example, me ^^), but overall I still recommend you to watch it.